We have tested iOS 9.3.1 with ForeFlight and are ready to issue an “all clear” to all customers. Feel free to download the update at your own convenience. At their March 21 Keynote presentation, Apple announced the release of a new 9.7 inch iPad Pro, which delivers the enhanced performance and features of its full-sized predecessor in the more space-conscious size of the iPad Air 2. Apple reports that the new screen reduces reflectivity by 40 percent and increases brightness by 25 percent compared to the iPad Air 2, and automatic white balance adjustments allow colors to stay accurate in different levels and kinds of lighting. Combined with iOS 9.3’s Night Shift, which adjusts colors after sunset to ease strain on the eyes, these features will likely make the new iPad Pro’s viewing experience the best for use in the cockpit. What we’re most excited about with the new iPad Pro is the ability to use it with Apple Pencil, introduced last year alongside the original iPad Pro. 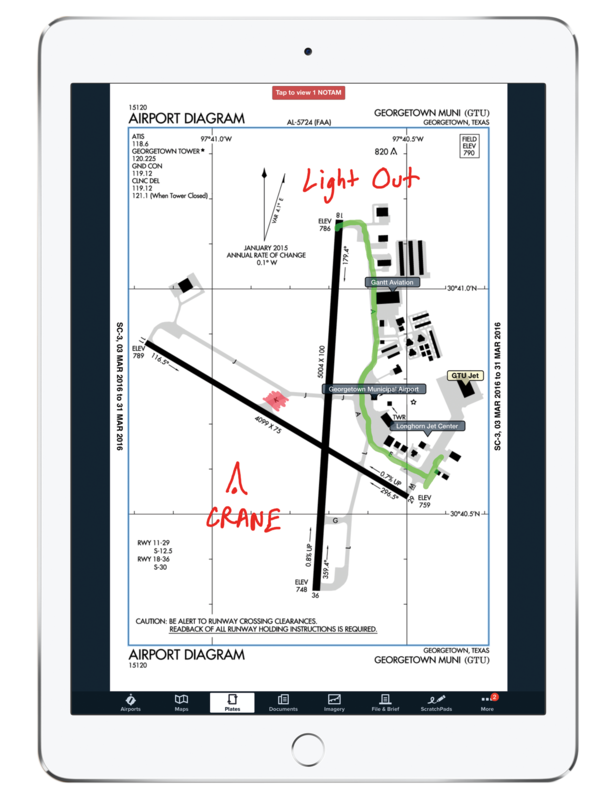 Made for the iPad, Pencil brings incredible precision to ForeFlight features like Scratchpads, annotations on plates and documents, and Logbook endorsements. Using the Pencil for these tasks helps you perform them faster and with better legibility over using a finger or a generic stylus. The ability to use this helpful tool with a smaller iPad makes owning a Pencil far more practical for pilots than when it required the full-size iPad Pro, which is over-sized for most cockpits. We’re looking forward to hearing your feedback on using the Pencil once the new iPads start shipping at the end of this month. ForeFlight 7.6 includes Logbook enhancements and expanded connectivity options with Garmin and Avidyne panel-mounted avionics. 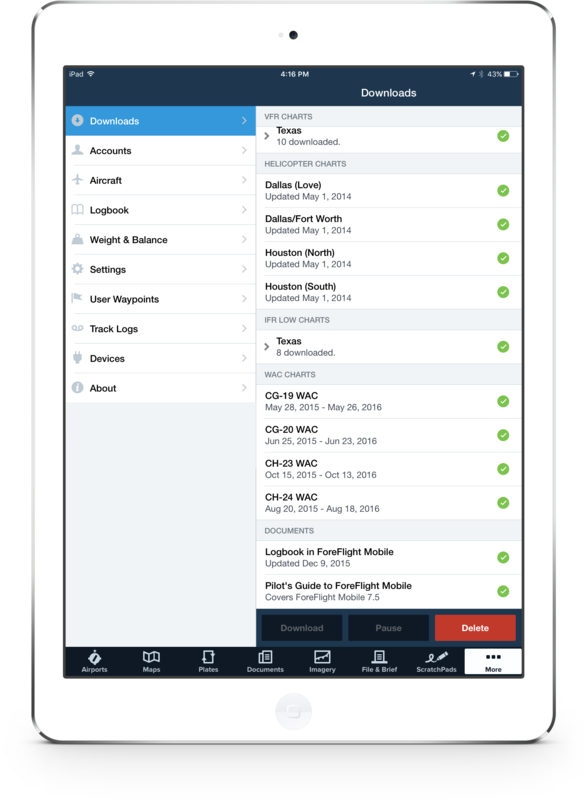 Photos take center stage in the Logbook enhancements delivered in ForeFlight 7.6. Now you can attach unlimited images—from your Photos app or fresh from your device’s camera—to flight entries, aircraft profiles, certificates, and endorsements. Use photos to capture the view on approach to the runway, keep a visual record of squawks, or take a selfie of you and your passengers. Once in Logbook, images can be cropped and rotated to your liking. 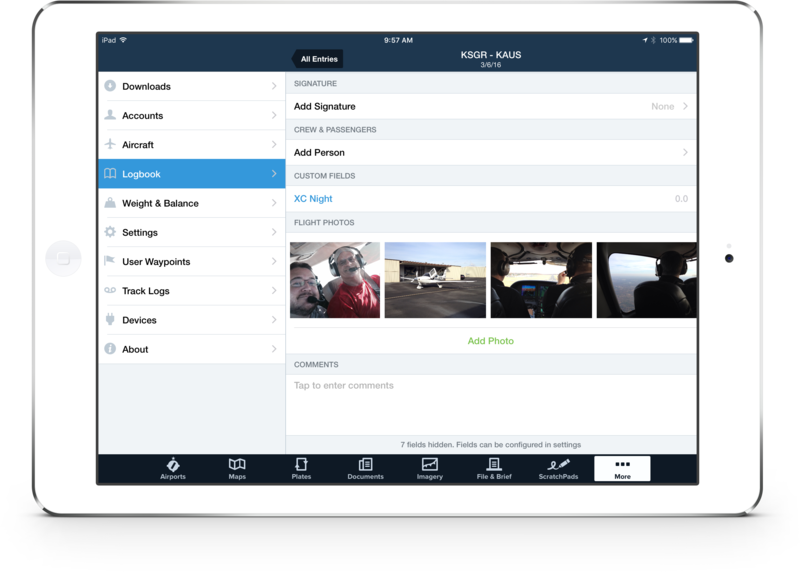 As with all your Logbook data, these images are stored securely in the ForeFlight Cloud so you can access them from all of your devices. We’ve also added an FAA 8710 report to serve as a guide for filling out your Airman Certificate/Rating Application. Both the 8710 and flight experience reports can be accessed from the new Reports section of the Logbook menu. You also have options to export to email or AirPrint from within the app. Finally, medical and knowledge test certificates with issue and expiration dates can be added in the Qualifications section, along with new custom type ratings. ForeFlight 7.6 includes full support for Garmin’s new GTX 345 ADS-B Out transponder, which can supply ForeFlight with ADS-B weather and traffic, WAAS GPS, and AHRS information, all while helping you meet the FAA’s 2020 ADS-B Out mandate. The GTX 345 connects to ForeFlight directly via Bluetooth — no Flight Stream required! We’ve also partnered with Avidyne to enable connectivity between ForeFlight and the IFD540/440 FMS. The Wi-Fi connection sends GPS position data to ForeFlight and enables flight plan transfer from the IFD to ForeFlight. Learn more about the ForeFlight Connect platform here. The ForeFlight Graphical Briefing has a new section under the Forecasts heading: Winds Aloft. This section was added to provide pilots with information about the forecasted winds aloft along their route of flight, an important component of any preflight weather briefing. The section includes forecasts for winds at 6 hour, 12 hour, and 24 hour periods, each contained in its own neatly organized table showing weather stations IDs along your route on the left, and altitudes along the top. Forecasts are provided for altitudes ranging from 3,000 to 53,000 feet, and a toggle switch at the top of the page allows you to restrict the altitudes shown to only those within 4,000 feet of your filed altitude, giving you quick access to the most relevant forecasts for your particular flight. In addition, the column showing winds aloft at your filed altitude is highlighted blue in each table. You can enable ForeFlight Graphical Briefing at any time by navigating to More > Settings, scrolling down the File & Brief section, and tapping ForeFlight Briefing so the slider turns blue. The FAA recently approved a set of new departure procedures for KATL, and we included these in ForeFlight’s most recent data cycle update. The new SIDs are designed to make use of existing Performance-Based Navigation (PBN) technology, and will fully replace 16 of the current SIDs later this year. For now, however, these new SIDs are only to be assigned by ATC; flights out of Atlanta should continue to be filed with the current SIDs until the implementation is completed. A NOTAM to this effect has been published for KATL. In addition to these replacement SIDs, a new WIGLE1 SID was published for use during special events, and is also ATC assigned only. A flight plan using one of the new SIDs may be accepted by ForeFlight, but will likely be rejected once it reaches the ATC computer, and even if accepted, will only cause coordination problems for both ATC and the pilot, so be sure to review the NOTAM before filing so you don’t accidentally use the wrong SID and have your clearance rejected. Of course, if ATC assigns you one of the new SIDs, you can use ForeFlight’s Procedure Advisor to load the route information onto the Maps view. In preparation for the large amount of air traffic expected around San Francisco before and after Super Bowl 50 this Sunday, the FAA has released a set of guidelines for aircraft operating in the area. These include a requirement that pilots obtain ramp reservations at numerous nearby airports, as well as restrictions on what routes can be filed to or from those airports. For your convenience, the latest data release includes a document detailing these guidelines, which can be found in the FAA section of the ForeFlight Documents Catalog. The document outlines special traffic management procedures, and guidance on the NOTAMs and TFRs that will be in place prior to the event. This information can also be found online at the FAA’s website. We encourage any pilots who plan to fly in or out of Northern California over the next week to review this information before planning a flight. 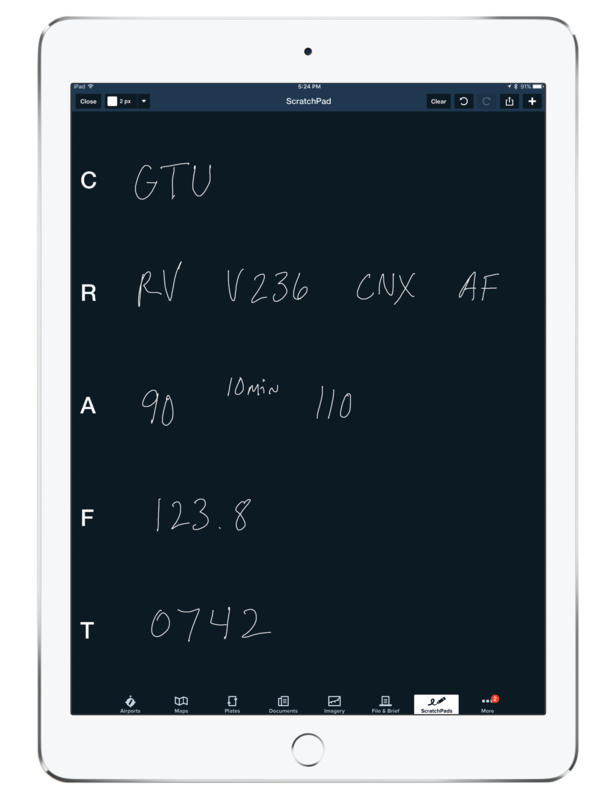 Our first release of 2016, ForeFlight 7.5.2, brings refinements to Logbook and improved PIREP markers on the Maps view. You can now view, print, or email your flight experience summaries right from the app. 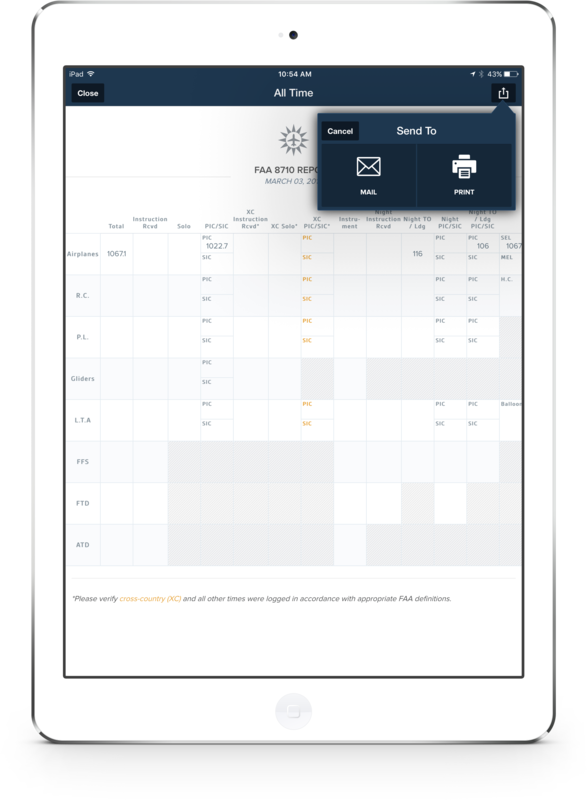 From the Logbook view, select the desired period of time from the Entries section (last 7 days, 30 days, 90 days, 6 months, or 12 months) and then tap the Send To button in the upper-right corner. Tap the Send To button in the upper right corner to view the selected report summary. Tap Send To again to AirPrint the report or email it as a PDF attachment. Also added is a flight time summary for the last 90 days, giving you another option in viewing or sharing your flight totals with others. ForeFlight Web. Log in to plan.foreflight.com/logbook and click the Export tab. The Pilot Weather Report (PIREP) layer on the ForeFlight Maps view received a facelift, and the newly styled markers can now convey important information even before you tap on them. Icons representing icing, turbulence, and general sky and weather reports change their appearances based on the severity of the hazard, and also indicate the altitude at which the report was made, if available. The icons you see when viewing AIR/SIGMET summaries have also been updated to match the new PIREP markers. Check out Scott Dennstaedt’s article for an in-depth look at the marker enhancements. Select PIREPs from the Map layer selector to view the newly styled PIREP markers. Back in June of 2015 the FAA announced that it will remove support for World Aeronautical Charts (WACs) over the coming year (official notice here). You won’t miss out on any coverage in this transition as complete CONUS coverage is already provided by VFR sectionals, and the FAA plans to introduce new VFR charts to cover the Caribbean before the WACs that cover it are discontinued. Printing for most of the paper charts was discontinued in September, while the two charts covering the Caribbean will cease being printed in February and March of 2016. WACs can still be used as a valid flight planning tool until they reach the expiration date, which for most charts is either one or two years after the issue date. You can view a particular chart’s issue and expiration dates in ForeFlight beneath the chart’s name in the Downloads view. Below is a table showing the expiration date of every WAC, ordered chronologically. The first three charts will expire January 7, 2016. These are the CC-8, CD-12, and CF-16 charts, covering parts of Alaska and the Northwest. Upon expiration, these charts will no longer be available for download in ForeFlight. If you download them before the expiration date, the charts will remain accessible, but a red “Expired” banner will show in the Maps view when those charts are viewed. At that point they can be removed from ForeFlight by tapping Delete > Delete Expired in the Downloads view. ForeFlight Web is now in open Beta, meaning that anyone with an active ForeFlight subscription can access it. Just go to plan.foreflight.com and sign in using your ForeFlight username and password. Plan a flight or view weather and airport information all from your web browser. Routes are synced to ForeFlight Mobile on all your devices, allowing you to pick up at the airport right where you left off at home. As a Beta program, we’re continually refining and adding new features to ForeFlight Web, and we welcome any feedback you have about how it can be improved.